New Touma x Phalanx MAZINGER Z figures in shop now!!!! Mazinger-Z is a Japanese manga and anime series originally created by Go Nagai in 1972. Phalanx, a design and creative company in Taiwan, developed a brand-new platform toy called "Mr. Power" in 2008. 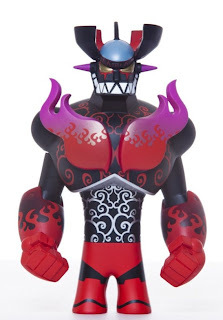 They invited the Japanese toy designer, Touma - well-know for many of his popular toy designs including the Knuckle Bear (resembling a human-like bear with grafitti stylings)- to create a new image for Mr. Power and Mazinger-Z, the "Power Mazinger-Z"! The design of Power Mazinger-Z keeps the essence of Mr. Power's figure shape and the essential elements of the classic Mazinger-Z. Touma also adds in his signature style, such as the big teeth with the beastly smile and the fire pattern. The dark version contains special red/black color. This is a limited edition only release of 100 pieces and is only available in the U.S.
We Only got a few in stock so hurry over and get them..These figures are beautiful.